Sorry, we have a technical problem at the moment. Please try again later. Unfortunately we can’t provide information about the services on flights with our partner Qantas. 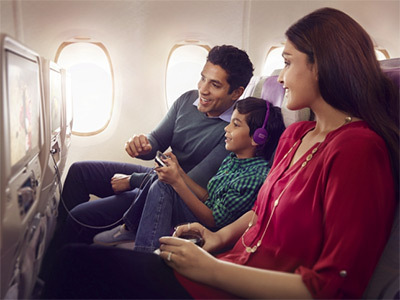 Please visit qantas.com for more information. Unfortunately we can’t provide information about the services on flights operated by other airlines. Please visit the airline's website for more information. Sorry, the aircraft you've selected doesn't have this class of travel. Please select a different cabin. Unfortunately we can’t provide information about the services on train journeys. Unfortunately we can’t provide information about the services on bus journeys. Her tail is long and she has wings. Aww… this is so fluffy. 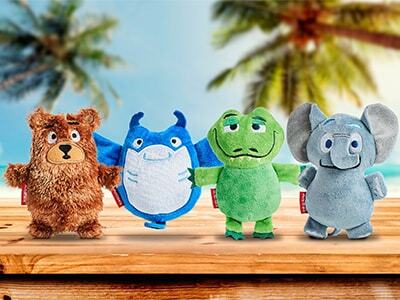 Little adventurers can share their journey with new furry friends from around the world. Brett the bear, Mia the manta ray, ChaoChao the alligator and Savannah the elephant, have joined our growing Fly With Me Animals family on board. You can pick up the older members of the gang at the Emirates Official Store(Opens an external website in a new tab) to complete your young explorer’s collection. Children can wrap up with their buddy in a blanket, use theirs as a bag or attach a cuddly companion to their stroller when they’re on the move. And they can also explore our Fly With Me Animals magazine, which is full of puzzles, games and comes with coloured pencils. It’s theirs to enjoy on the flight and to take with them when they land. In our airport lounges you can use our mother and baby room to change and feed your little adventurer, and children can enjoy video games in our play areas. Satisfy healthy appetites with our meals for children and babies. Young flyers between two and 12 years old will love our range of children’s favourites. They’ll also get a snack box filled with treats to enjoy along the journey. If your child has a special diet, tell us when you book and we’ll serve a meal that’s right for them. 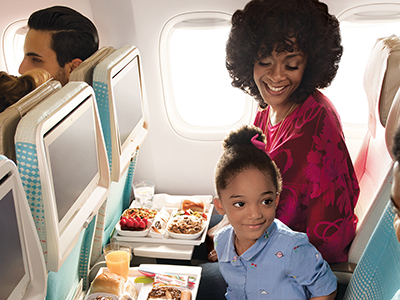 Choose from our range of prepared baby meals, or if you’d prefer to bring your own, our cabin crew will help you with food and bottle warming. 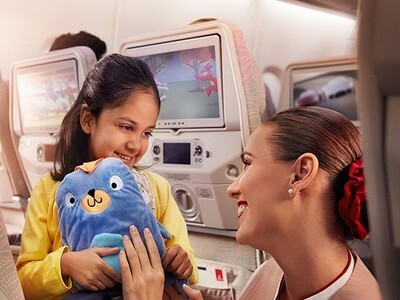 Watch faces turn into toothy grins with our dedicated children’s inflight entertainment. Kids can pop on their brightly coloured headphones and choose from a huge collection of Disney favourites, the latest kids TV shows and popular cartoons that feed their imagination. They can also challenge themselves or their friends to more than 100 exciting inflight games on our award-winning entertainment system, ice. Capture special moments with our onboard camera. Ask our crew to snap your picture and you can take home a framed photo of your adventures together. Young adventurers earn Skywards Miles as they fly. Spend them on great rewards, like free flights, Apple iPods and free trips to Wild Wadi Water Park in Dubai. We’ll also give them extra special treatment – if your young flyer likes the window seat, being a Skysurfer helps them get one when they fly. It’s easy and free to join.